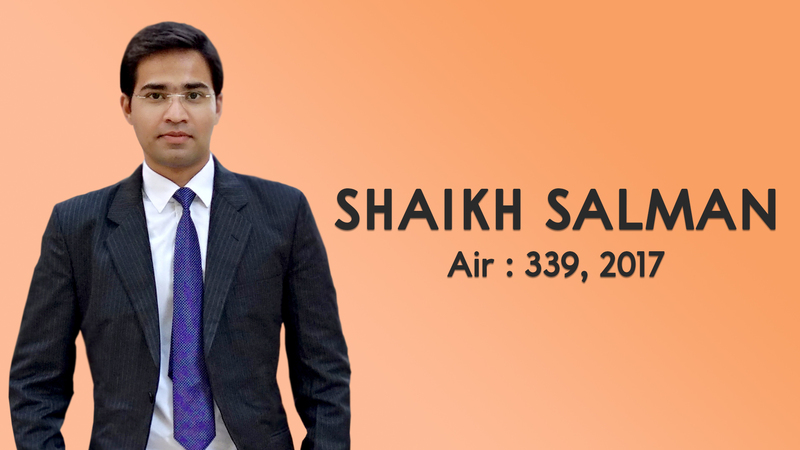 An Interview with Mr. Salman Shaikh who has been finally selected in Indian Revenue Service (IAS) Exam. He has been ranked 339 in the final merit list. KLA-IAS: There is a general perception among the candidates that this examination is based on a process of elimination and not the selection. Do you agree with this kind of perception after having successfully qualified in this examination? Salman Shaikh: Prelims is an exam based on elimination as selections are very less compared to the number of students appearing in the exam. But the mains and interview stages are based not on elimination but on selection. KLA-IAS: How did you make this success possible? Is there any specific strategy which you would recommend for success in this examination? In my fourth attempt, I concentrated on myself. Earlier I was focusing on strategy of other people, this time I made my own strategy that helped me a lot. In prelims, I started from syllabus then previous year question papers (It is a key to success in prelims) and then I followed test series. In Mains, I followed 4D strategy where I maintained 4 diaries. For example, separate diary for essay in which I collected some stories, some introductions, conclusion etc. I made my second diary for facts because factual information matters while making arguments. Third diary was made for diagrams. I had learnt from toppers that you need to show your innovation and creativity for mains answers. I collected pie charts, flow chart, graph, maps etc. For interview, I gave approximately 15 mock interviews and also practiced with my friends. KLA-IAS: What was your source for inspiration? Whom would you like to give credit for your success? Salman Shaikh: My background is the source of my inspiration. From my area, I am the first graduate since independence and my family belongs to agricultural background. Life there is very difficult which is a source of motivation for me. Hard work of my mother and father also inspires me. KLA-IAS: Did you intergrate the length GS syllabus for prelims &Mains preparation together or you prepared it separately? Sustainable Developement Goals for example is very important for prelims, mains and interview. I prepared it for all three phases but in a different manner. I think integrated strategy works. One should integrate the syllabus which is common for prelims and mains and prepare that syllabus with mains perspective. Some topics are solely for Mains exam like World History, Disaster Management, ethics, optional and essay. That should be prepared separately. KLA-IAS: How relevant are the newspapers reading for this examination and how did you try to link it with your GS preparation? Salman Shaikh: We have to cover current affairs from newspaper rather than just reading it. I was not able to read newspaper consistently. I used monthly magazines to cover my current affairs. For interview, I followed two newspapers i.e. The Hindu and Indian Express. KLA-IAS: Did you adopt any specific strategy for Ethics paper? How did you prepare for case studies in this paper? In my 4D strategy, I made one diary for ethics in which I used to collect definitions, important ethical keywords (like crisis consciousness, integrity, aptitude) to write my answers in more flourished way. I used to collect examples because if you substantiate your argument with examples, it will fetch more marks. I used to add some models to quote them in case studies. I discussed case studies with my friends to bring more clarity on the issues. KLA-IAS: How did you select the relevant material for the lengthy syllabus? Salman Shaikh: Previous year question papers and syllabus are the keys to know what to read and what not to read. KLA-IAS: What was your optional subject? What was in your mind while selecting the optional subject? Your interest and ability to score in that subject. KLA-IAS: What was your answer writing style? Was it a paragraph format or bulleted point format? Salman Shaikh: Practice makes the man perfect and answer writing is a skill, so more you practice, your skill will be more polished. I used Vision IAS sectioned papers for Mains. I used to practice 4-5 questions daily that helped me a lot. I gave test series for Mains, GS, essay and optional paper. I also used to write voluntary tests like I have written previous 5 years mains paper for my optional. KLA-IAS: How did you manage to stick to the 200 words limit while writing the answer? You can write your answer in bullet format, use diagrams to express your views in lesswords but in a very comprehensive manner. Choose those questions in which you are more comfortable and attempt them firstly then focus on other questions. KLA-IAS: Did you undertake any test series? Do you think these test series are helpful in preparing for this exam? Salman Shaikh: Test series teach you a lot, it covers your syllabus. It teaches you about structure of your answer, how to start your answer, body, how to use diagrams and suggest measures or way forward for a particular topic. I undertook many test series for prelims and mains. KLA-IAS: What is your opinion regarding practicing previous year question papers? It helps you in deciding what to read and what not to read. UPSC repeats 2 to 3 questions every year from previous year paper in prelims. If you look at mains paper, UPSC used to repeat themes for example, health, employement, digital India, Smart cities and villages, Disaster Management etc. If you follow Previous year question papers, your burden of preparing the paper is reduced and your approach towards of will be more focused. KLA-IAS: Did you find internet & online material useful? Which sites would you recommend? In case you are not comfortable or have any doubt regarding a particular topic, you can take help of internet but one should use it wisely and restrict its use. KLA-IAS: How important is the preparation for final interview? How did you prepare for it? First I focused on myself for interview and read each and every thing related to me for example my educational background, my district and state etc. I appeared in many mock interviews and also had mock interviews with friends. Confidence is the key, you should be humble, genuine and truthful. You should not try to fake anything to the interview board. KLA-IAS: On the basis of your preparation for the previous civil services examination, what modification you would be making in your strategy in case you decide to appear for the examination one more time? I concentrated on myself. I am very confident and optimistic that I will do it. Believe in yourself. I added creativity and innovation for example diagram, factual data, flow charts etc. KLA-IAS: What is your opinion regarding various comprehensive magazines and books published by Kiran publications for civil services examination? Salman Shaikh: I have already discussed that solved paper by Kiran publication is really important for aspirants if they want to understand the pattern along with answer. There is no way forward to it. KLA-IAS: What is your advise for future civil service aspirants? How should they keep themselves motivated during the exhaustive and lengthy preparation for this examination? Implement your strategy, sit for 10 hours, practice question papers, write answers etc. Don’t forget yourself because this life is very unique, enjoy and celebrate yourself and believe in yourself.